But, Chocolate Candy Bar Cake is better! In fact, Chocolate Candy Bar Cake is quite possibly the best and last chocolate cake recipe you will need! 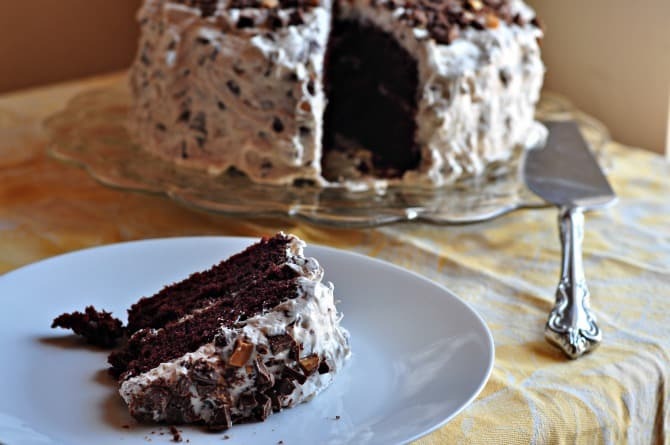 If you are looking for a decadent dessert, look no farther – the Chocolate Candy Bar Cake recipe is it! Now, “need” may not be the appropriate word when talking about a chocolate cake but you gotta try this recipe – I think you will agree that you “need” it! I always start with the Lazy Woman’s Chocolate Cake recipe as a base but if you are short on time, a chocolate cake mix works too. Actually, I think I can have the Lazy Woman’s Chocolate Cake recipe mixed up in almost the same amount of time as it takes to open a box and add eggs, oil and water – and without the added preservatives! Please Note: While this recipe does not fall into the traditional foods category, there are times when we give in to our desire to eat and enjoy something sweet. I do reserve this recipe for special occasions as part of the 80/20 Rule, and, it is delicious! Prepare the Lacy Woman's Cake or cake mix according to directions. Pour into 3 greased 8" round pans. Bake at 325F for 20-25 min. or until a fork comes out clean. Cool the cake in the pans for 10 min. Beat cream cheese, powdered sugar, and sugar at medium speed with mixer until creamy. Chop 8 candy bars finely. Fold cream cheese mixture and chopped candy into whipped topping. Spread icing between layers and on the top and sides. Chop the remaining 2 candy bars and sprinkle over the top of the cake.